This is Mountain Kid, the Canadian Brother from the beautiful province of British Columbia, Canada. It is now autumn in British Columbia and it is so beautiful here. The trees have started to turn colour and there is a thin layer of snow on the tops of the mountains. It is starting to get cooler during the day and very cold during the night. The animals are very busy in the mountains at this time of the year, scurrying around for food. It is fun to watch the squirrels and chipmunks go from tree to tree storing their stash of acorns. They seem in such a hurry and don’t even care that I am watching them. They will soon enter their hibernation for the winter months. The mountains are a range of golden colours in the autumn. The lakes, clear icy blue, look very cold and fresh. The campgrounds are all empty of campers and stand lonely waiting for the next camping season to come. The autumn moon hangs low in the sky and it looks like you could touch it if you stood on the highest mountain peak. On a clear night in British Columbia, the stars still dazzle in the sky. 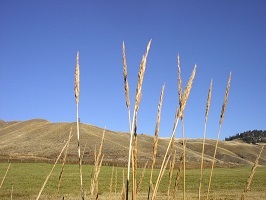 Ranchers must get their land ready for spring. Hay and other crops must be brought in and fertilizer needs to be spread. Autumn in the mountains is a very busy time of the year for ranchers. Autumn is beautiful in the mountains. Example: Mountain Kid lives in the mountains of British Columbia and he knows autumn in the mountains is beautiful. This entry was posted in Autumn Stories, Canadian Family Stories, Grade 5 Level, Mountain Kid Stories and tagged autumn, autumn in the mountains, icy, Mountain Kid, mountains. Bookmark the permalink.